I have been blessed with a BFF who is hilarious and I am proud to call her my sister! We have a joke that I have known her “most” of my life! I was 9 years old when my sister was born and we are inseparable! 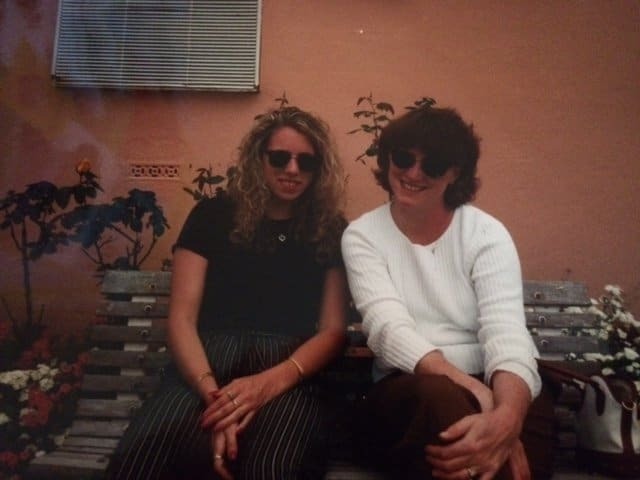 As you can tell by our picture above, we went through a lot of hair products in the early 90’s! Erin is my son’s Godmother and this photo was taken at his Christening. Right behind us is my Mom, Dad, and Great-Granny Annie, adorable! 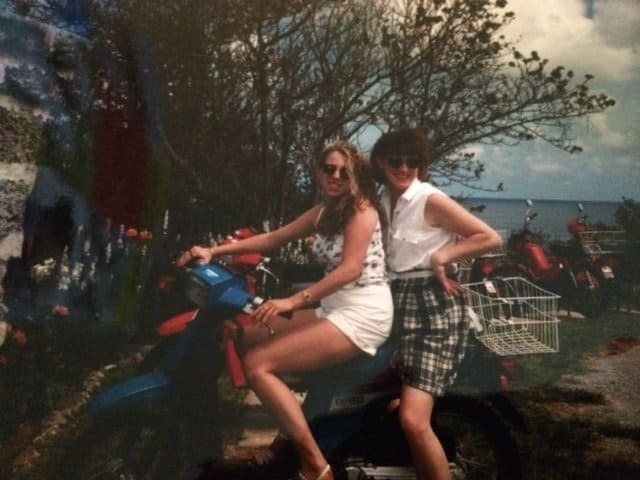 Erin was also my Made of Honor, 27 years ago! She was a baby at fourteen, but the most perfect choice for me! Wow, that was a long time ago! My kids are so lucky to have the cool Aunt who always was helping out when they were young! I love this picture of us! Sort of shows our personalities! My Dad always calls us Day and Night because our personalities are so different but it works for us! BFF’s! Growing up was a lot of fun, especially in the mornings! We would sit around the kitchen table and talk about our plans for the day ahead! Every morning, Erin and I ate a bowl of Cheerios™ and milk for breakfast! Even today, my sister and I still love to sit around the kitchen table, eating our Cheerios™ , talking about old and news times. Things have really changed since these pictures were taken. 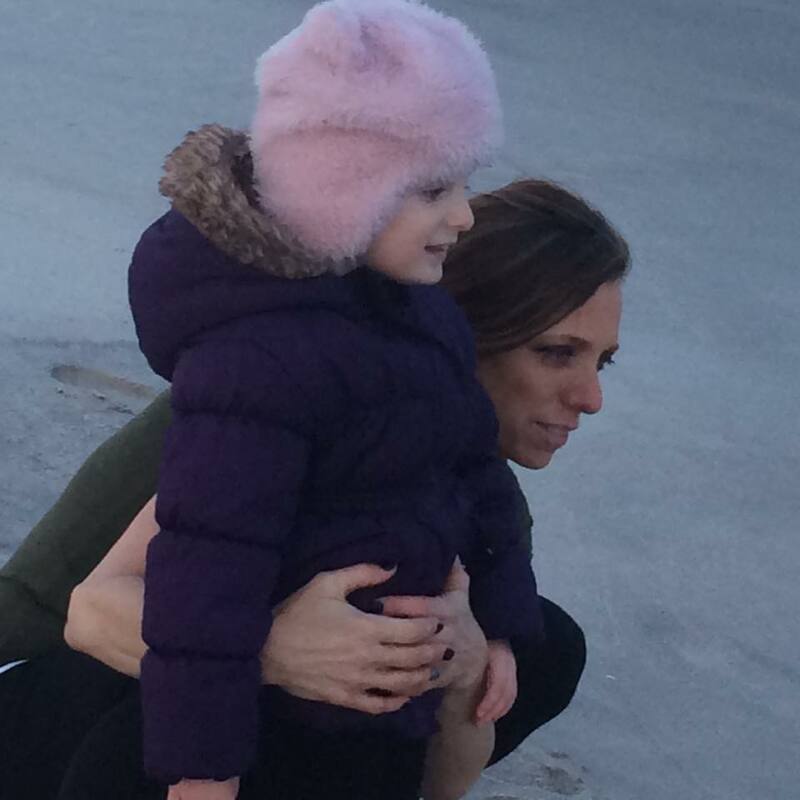 I’m a Mom with four kids and my sister is a Mom to a beautiful 3-year-old daughter. Guess what, my kids and niece love Cheerios™ too! Here are our two munchkins together! They have the same beautiful relationship that we do and their age difference is quite similar. 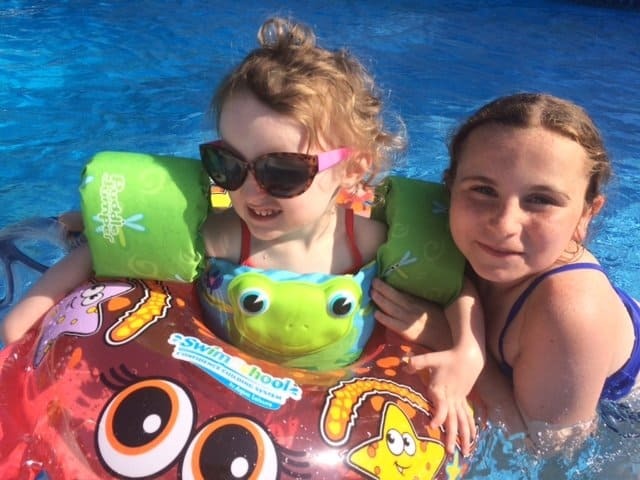 If you couldn’t already tell, Erin was at work and I was in charge, thus the reason my niece is wearing both a floatie and swimmies( those are my very technical terms for flotation devices) and I had her barricaded in the shallow end of the pool,where she can actually stand. When your Auntie is in charge, one can never have on enough flotation devices. Erin works long hours as a nurse and I am super proud of her and all of her accomplishments! I respect her work ethic and despite working 13 hour shifts, she comes home and jumps right in to being a great Mom! That is why I was so excited to discover something wonderful at Walmart ! 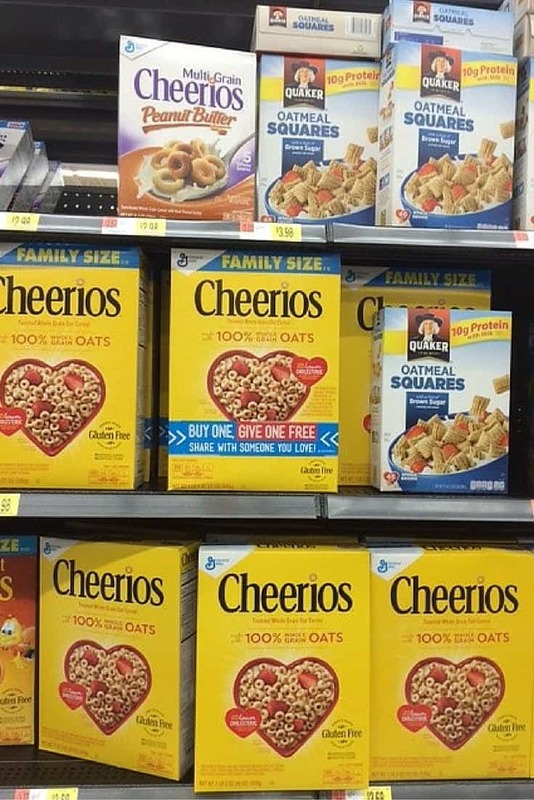 I was shopping for cereal and I saw a unique message on boxes of Cheerios™ ! On the box, it said, Buy One, Give One Free, Share With Someone You Love and I had to check it out! I found out that there are specially marked boxes of Cheerios™ being sold only at Walmart. Inside those specially marked boxes is a code. Enter that code online and send an e-card to a special someone so they can get a free box of Cheerios™ at Walmart! So I immediately thought of Erin! I just had to do this for her! Its fun and super easy to do! 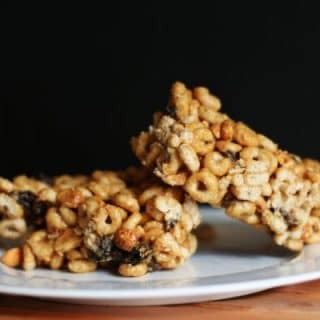 I decided to also make her a batch of Cheerios™ No-Bake Cereal Bars that we have made since we were kids! I made these with Erin when she was younger. I still make them for us, my kids and my niece. They are very easy to put together and just set in the refrigerator for an hour or two and you have a delicious cereal bar! We make these with Cheerios™, peanut butter, dried cherries, roasted nuts, agave, and light butter. Spray an 8 x 8 square pan with nonstick cooking spray. 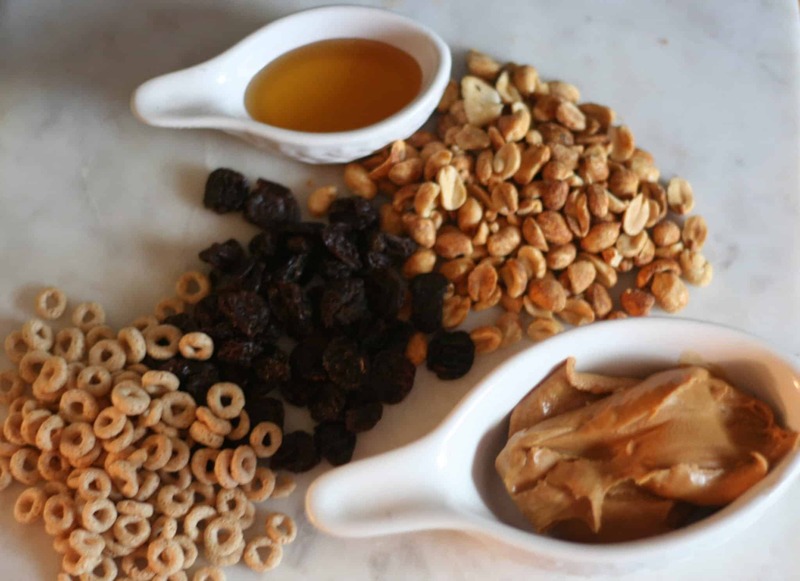 Add in the cereal, dried cherries and honey roasted nuts, stir to combine. Add the peanut butter mixture.I microwave the butter, agave, and peanut butter for one minute and then stir. I check after another 30 seconds to see if the mixture is combined. I place the pan in the refrigerator for at least one hour and the Cheerios™ No-Bake Cereal Bars are ready to eat! How easy-peasy is that and everyone is happy! Thank you for always sharing my passion and love for food, family, and fun! 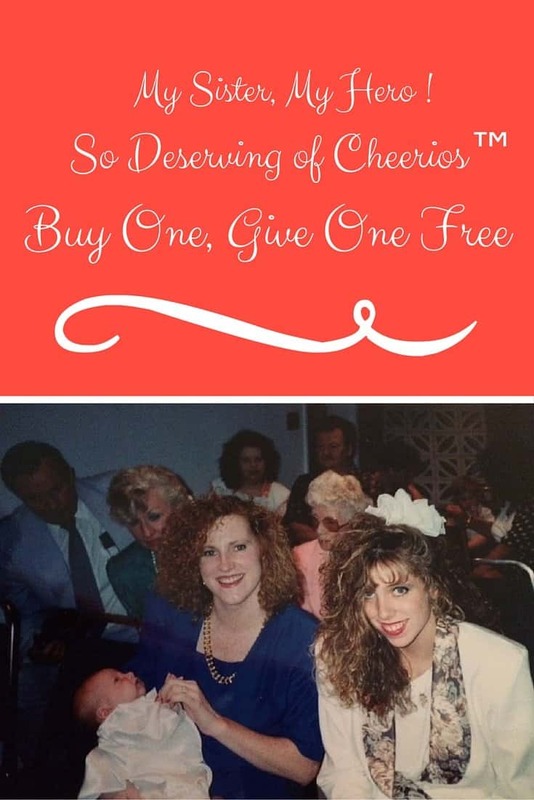 With whom would you share a Buy One, Give One Free, box of Cheerios™? 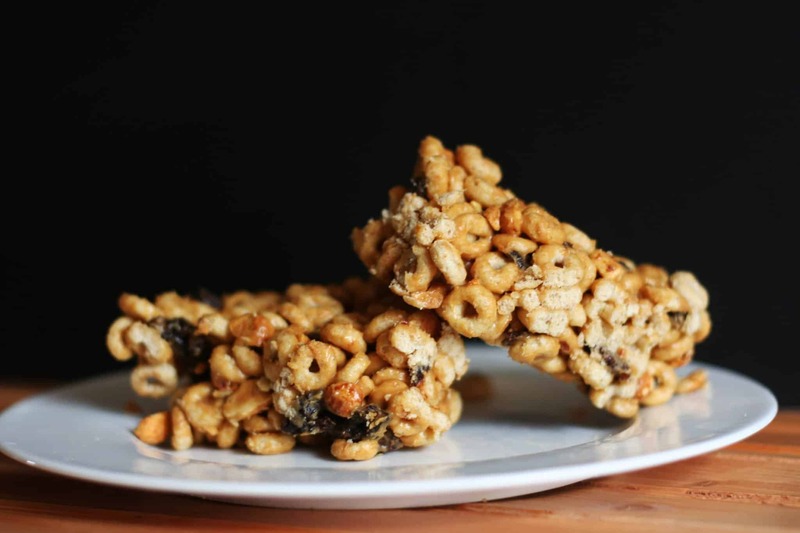 An easy no-bake cereal bar to prepare without needing to bake. Only a microwave to warm the ingredients. Spray an 8-inch square pan with cooking spray. In a microwavable bowl, combine the creamy peanut butter, agave, and light butter. Microwave on medium heat for 1 minute. Stir the mixture. Microwave another 30 seconds if necessary. The mixture should be melted. Pour the melted peanut butter mixture over the Cheerios™. 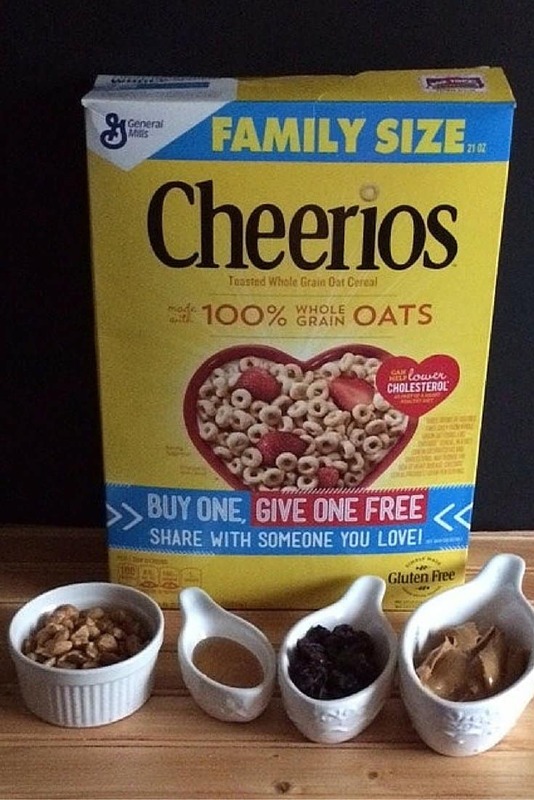 Combine the ingredients to fully cover the cereal mix. Press into the pan with the back of a spoon. Keep them covered in the refrigerator. Those bars look so good! I absolutely love it. It’s great to have such a positive influence in your life, I loved seeing all of the family photos. Wow! You guys really love your cheerios, it is so lovely to see that you call each other BFF’s and the bond between you all is adorable! 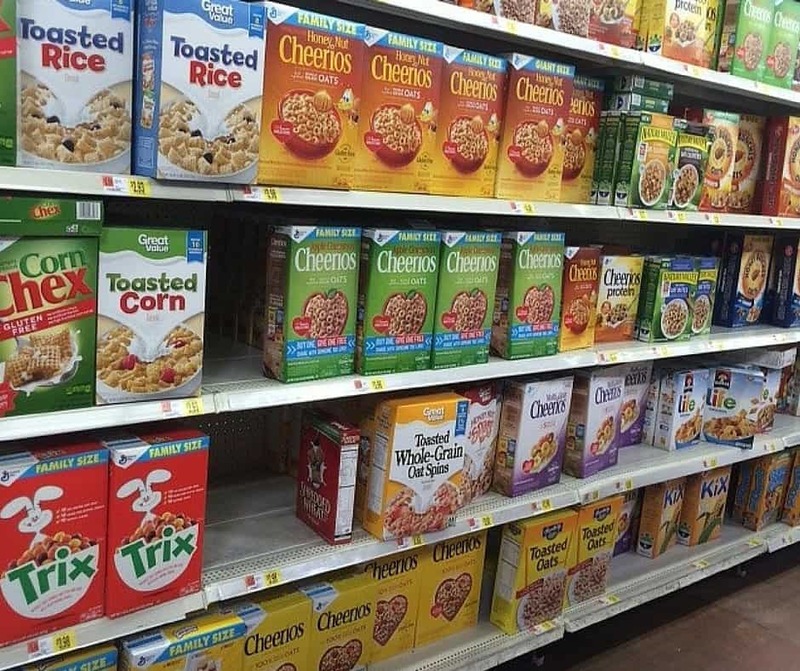 A BOGO deal on cereal is always a good thing. I also love that you included a cereal bar recipe. I bet they are super yummy, and cheaper to make than the ones you buy! It is so wonderful that you and your sister have such a close and enduring relationship! Thanks for the cereal cars recipe, too – it looks yummy! Being so close with your sister is such a blessing! And those cereal bars look so yummy! These look delicious! And this is the sweetest story about your sister. I am glad you all are so close! It’s so nice when you have friends that you feel this close to. I have always said that sometimes friends are the family that you would have chosen if you had been given that option. My sisters are my best friends, too. They were like my babies before I had my own. This post made me miss them! I lvoe Honey Nut Cheerios. Those bars look yummy. I think I read somewhere that cheerios are gluten free. Is that true? I love the concept of buy one give one. What a wonderful way to celebrate your relationship with your sister! And I love Cheerios! I need to find that promotion that says buy one get one and stock up! You are so lucky to have a great relationship with your sister! I can’t wait to try the recipe above. What a sweet post and a fun idea! I have not made those bars before, but they look really good. This is such a great post! Very nice to have some good stories to read every now and again. I am an only child so I always think it would be nice for my kids to have aunts and uncles. That is so sweet. I’ve always wished I had a sister and love how close sisters are. I’m glad that I had 2 girls who could love like that. We eat cheerios at our house A LOT! There’s just something about Cheerios that feels like home 🙂 . Your sister sounds like a wonderful person. From a cancer survivor, please thank her for beinga nurse. I don’t know how I would have gotten through chemo without my nurse. I will Heather, continued good health for you as well! I think that every woman should have the opportunity to have a sister. I love my sister more than anyone in the whole world! Now I know exactly what tasty treat to make with my sister’s little munchkins when I visit them at the end of the month. Can’t wait to enjoy some sister and niece and nephew time. I’m visiting my sister and her munchkins at the end of the month, and I can’t wait. I know they love cheerios, so we might have to make this fun snack. I have a sister that is 9 years older too. I love that we are so close now that we are older. Cheerios of course are in every kids life including my kids. I haven’t made cereal bars in ages! i would share a box with my mom, sister or daughter! My sisters and I are best friends, too! 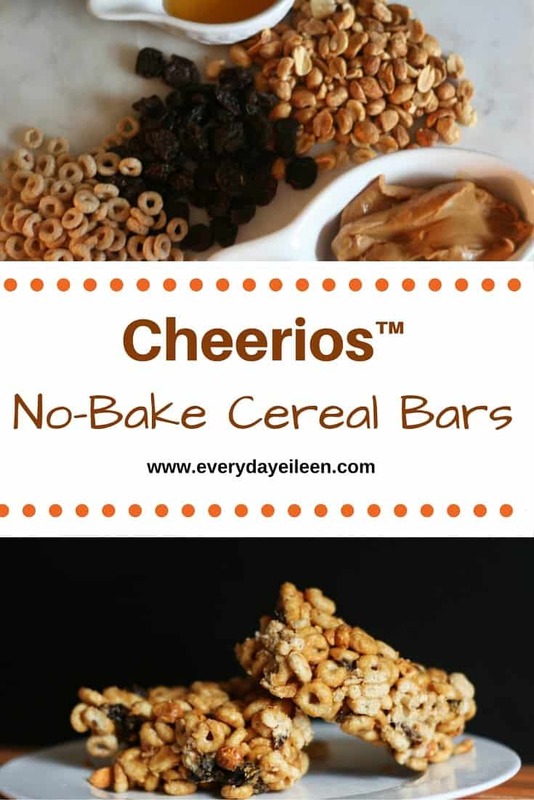 Those cereal bars look delicious and seem prefect to make on weekends for a busy week. Yum, these look like a fantastic afterschool snack for my kiddos! We love Cheerios over here! Those cereal bars are so yum! I am going to make those for my kids because I think they will really like them.